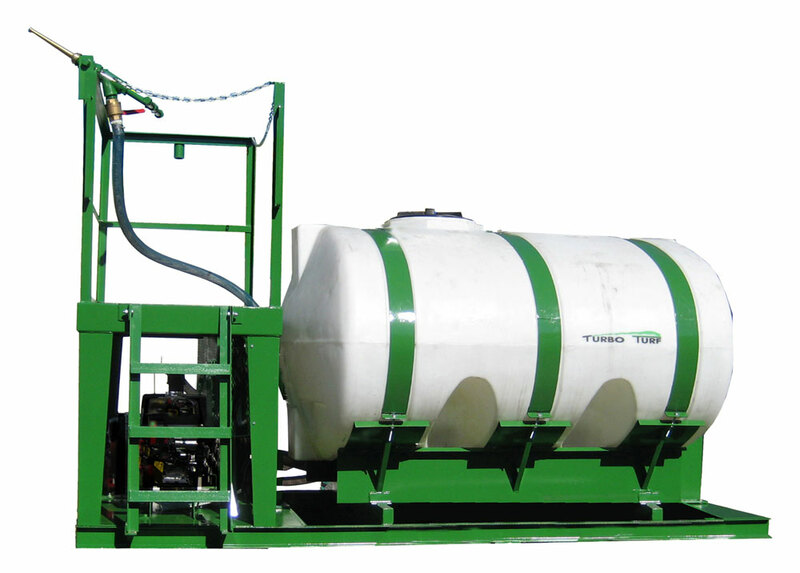 The HS-1000-ZX, is a 1000 Gallon, skid type hydroseeder. It will seed 13,000 square feet per load. It is equipped with an 27 H. P. Kohler Command Pro engine that is directly coupled to a 4″ X 4″, 720 G. P. M., 78 P.S.I. high volume centrifugal pump that was designed specifically for hydro seeding. 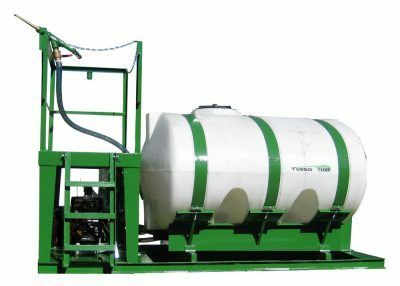 The unit comes with 100′ of 1 1/2″ discharge hose, gun and 3 nozzles ( 1 wide hydro seeding nozzle, 1 medium nozzle and one straight nozzle). The Jet “Bale Buster” is standard on this unit. The empty weight of the unit is 1595 pounds. the loaded weight is 9550 pounds. the physical dimensions are 82″W x 123″L x 78″H. The size of the skid frame on this unit is 61″W x 115″L. 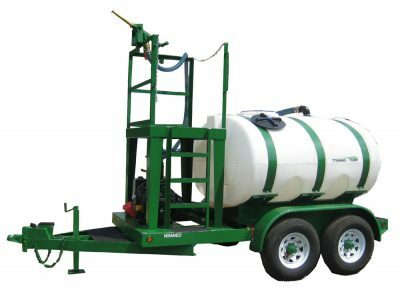 This unit can be mounted on the back of a truck with sufficient load capacity or it can also be easily operated from a trailer. The HS-1000-ZX is ideal for a landscaper doing residential and commercial seeding with average jobs. On large jobs up to 4 acres can be seeded per day with a good water source. It is not necessary to mix full loads so it is capable of handling smaller jobs. Material is applied at approximately 65 G.P.M. Time to spray a complete tank is about 20 minutes. Mixing time is 1-20 minutes depending on material. This unit comes with 100′ of discharge hose. It will easily handle an extra 200′ of hose. The spray distance with the straight nozzle is approximately 55′. The spray distance with the platform gun is 80′. The HS-1000-ZX features a 4″ X 4″ 740 gallon per minute pump, 87 P.S.I. pump. The 2″ I.D. jets equipped with a quick coupler for easy service in the unlikely event of a problem, a quick disconnect for the discharge hose, and a bale tray for easy loading. This unit used a MIG-40 centrifugal pump with 740 gallons a minute of flow and 87 P.S.I. of pressure. This pump was designed specifically for hydro seeding. The housing material is cast and it is very low maintenance. There are no grease fittings and the only maintenance required is to winterize if at the end of the season if it is stored where temperatures go below freezing. The pump impeller mounds on the end of the engine shaft so there is no power loss. Typically it can operate for 5 to 10 years with no maintenance. The only thing to be careful of is to not run it dry. The HS-1000-ZX-P is permanently attached to a DOT approved double axle trailer with brakes on both axles, DOT lighting, a breakaway, safety chains and an on-board test box for the breakaway battery. The trailer has a GVW of 12,000 pounds and is 15’8″ long an 88″ wide. It is available with either a 2 5/16″ ball hitch or a pintle hitch.